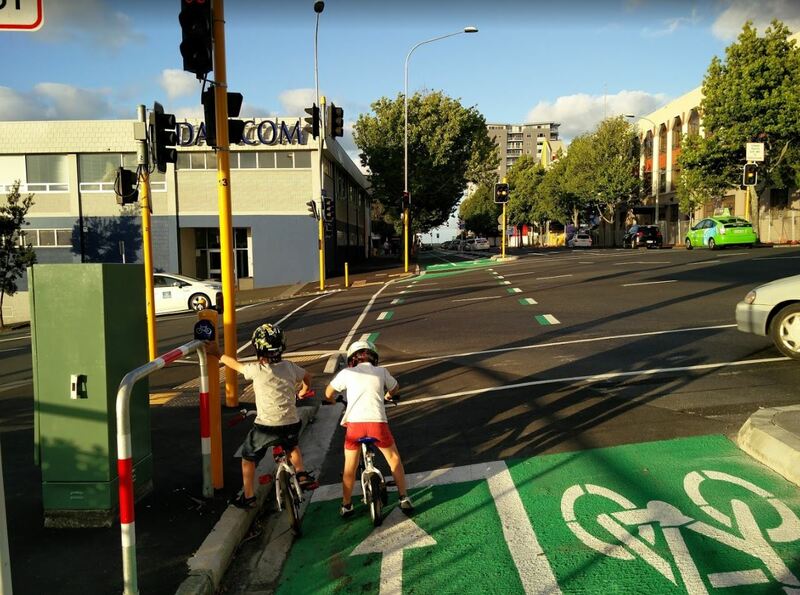 The Nelson St Cycleway was completed just over a year ago and has been a fantastic addition to the city. Since then we’ve been patiently waiting for Phase 2, which has had a particularly long gestation period. It is intended to extend the cycleway to the Quay St cycleway and also includes extending it along Pitt St to Karangahape Rd. Auckland Transport originally consulted on a design way back in September 2015, months before Phase 1 even opened. We weren’t thrilled with the design which would have seen the cycleway cross diagonally to the eastern side of Nelson St before sending cyclists along Sturdee St and Lower Hobson St, across in some places incredibly narrow footpaths, before reaching Quay St. We, and others, wanted the cycleway kept on the western side of Nelson St and linked into the tree lined Market Place. We also liked this well illustrated idea from reader Jonty to send it via the Hobson St Viaduct. Just before Christmas, Auckland Transport finally announced the outcome of their consultation and the final design. Like we’d see in some earlier board reports, AT confirmed that the cycleway would now link into Market Place rather than using Sturdee St. 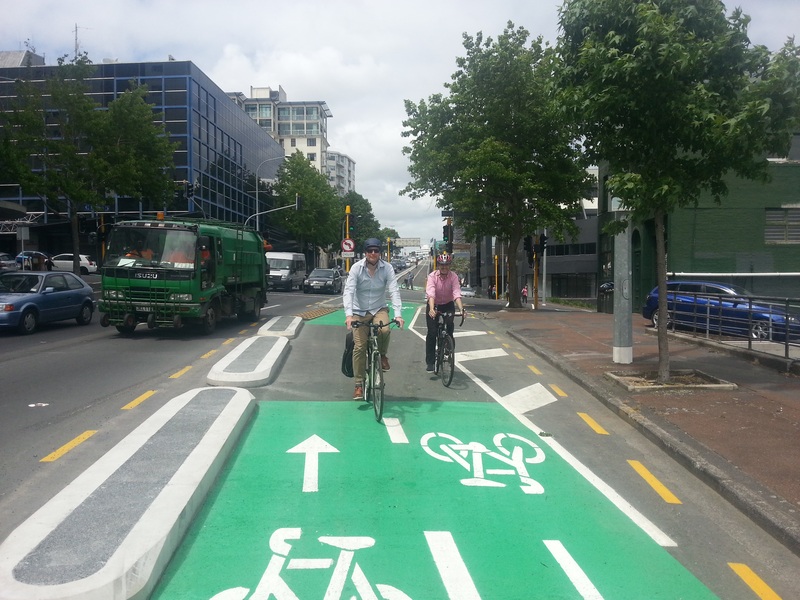 The link that will complete Auckland’s city cycle loop is a step closer. 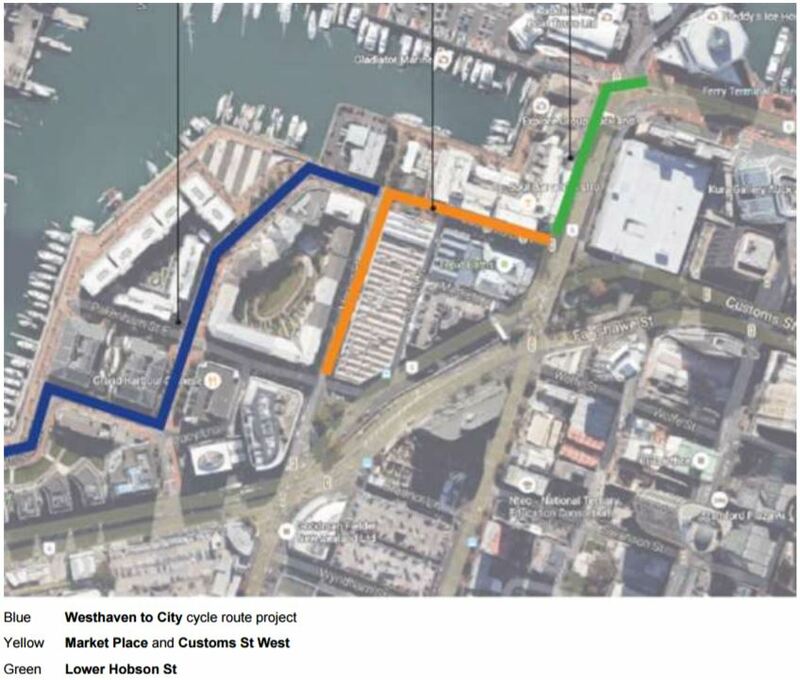 The route, announced today, will connect the Nelson St Cycleway with the waterfront. 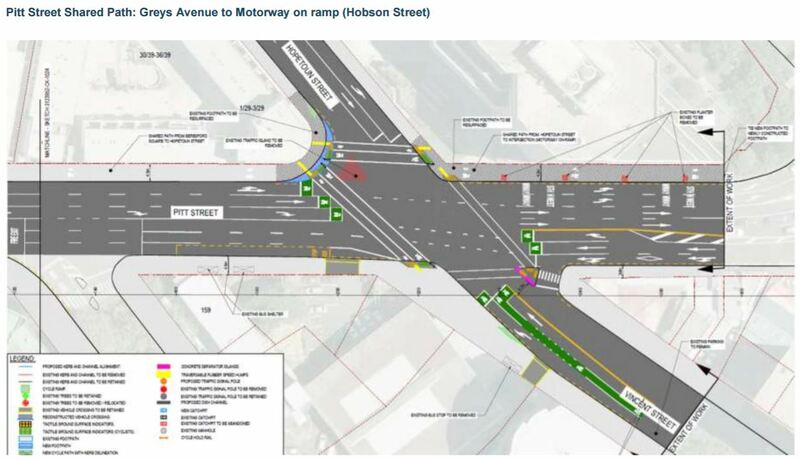 The connection along Nelson St to Quay St via Market Place, Customs St West and Lower Hobson St, will complete the loop. The city cycle loop includes cycleways on Quay St, Beach Rd, Grafton Gully and the pink Lightpath. 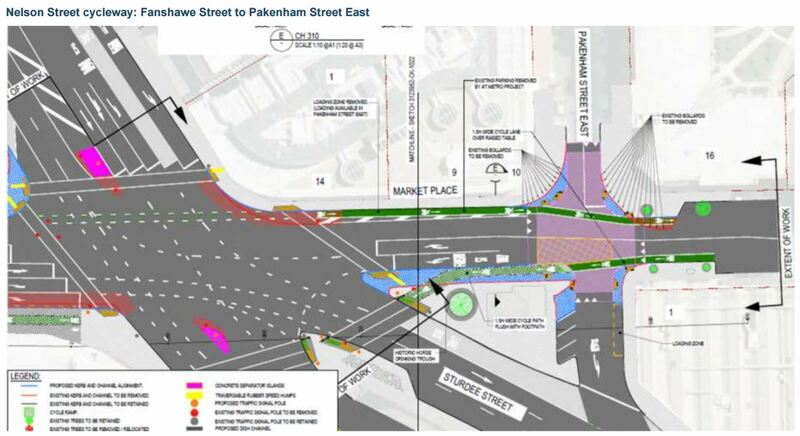 Phase 2 of Nelson St Cycleway will include protected, on-road cycle lanes on both sides of Nelson St and Market Place from Victoria St to Pakenham St East. Construction of this section will start in April and be completed by July. Plans for the remaining section of Market Pl, Customs St West and Lower Hobson will be made public in early 2017. The major difference from what we suggested back in 2015 is that instead of the cycleway being completely on the western side, it will be split with northbound (downhill) cyclists staying on the western side but southbound (uphill) cyclists using the eastern side. We’re comfortable with that change. 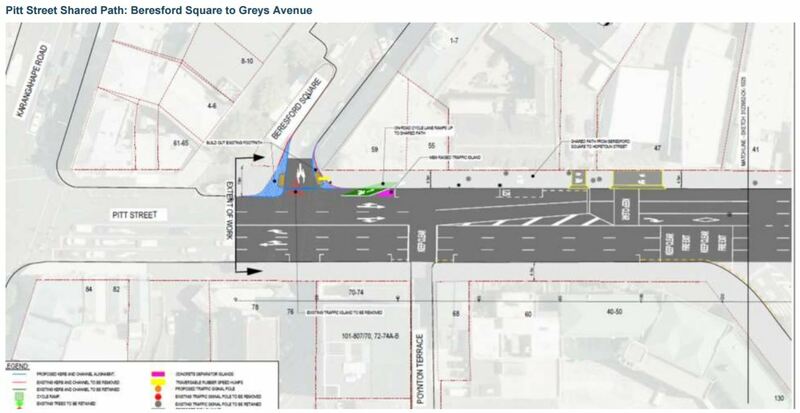 As we understand, the biggest hurdle, and the reason it’s taken so long to confirm the design, has been the need to convince the traffic engineers that carmegeddon wouldn’t ensue from removing the two lane signalised slip lane from Nelson St on to Fanshawe St. The cycle lanes on either side of the road will be protected. The biggest challenge will be the driveways and so all road users will have to take care here. It’s the Nelson/Fanshawe intersection that will see the most change with the left turn slip lanes removed to allow the cycleway to be built and the kerb built out on the western side which will be a welcome addition to the many pedestrians that walk past here and who are currently squeezed into a narrow space. The cycleway heading southbound will have a short section of being a shared path till it gets past Wyndham St. It will also require two legs to cross from Market Place which is a bit annoying. Finally on Market Place the cycleways continue past Pakenham St.
AT are still working on the final design for Market Place which is why it hasn’t been included yet but from what we understand of it, it will good. From Market Place the intention is to use Customs St West and then Lower Hobson St. The news for the Pitt St section isn’t so great though. Here, AT have scaled the design back to a simple shared path. They say this is caused mainly by the CRL and the significant disruption it will have on the area both during construction and after it with where they’ve decided to put vents. Since design for this cycleway project started in January 2015, there have been changes to the CRL (City Rail Link) design, particularly the vent location in Pitt Street. The CRL team have advised that the CRL project will cause significant disruption including a very large excavation across Pitt Street in the Beresford Square vicinity. AT met with key stakeholders in the area, including local businesses, NZ Fire Service, and St John NZ, to listen and understand their concerns. Based on feedback received from submissions and also from meetings with key stakeholders, we have decided the cycleway should be re-scoped to provide an interim off-road shared path facility for Pitt Street. AT is developing a design for CRL in the vicinity of Pitt Street and Beresford Square, incorporating the Pitt Street and Karangahape Road cycleways. Here are the designs, which as you can see still retain a gap between Karangahape Rd and Beresford Square. It’s not clear how less confident cyclists will bridge this gap, presumably most would use the footpath. As the press release earlier said, construction of the first section down Nelson St is expected to start in April and at least that and the section to Quay St are expected to be completed in the middle of the year. Its about damn time. Great that they finally went with the Market Pl option. It seemed obvious from the start. From that drawing I don’t see why they can’t put in an on road cycle lane right across the intersection in the southbound direction when the market pl right turn runs. Pity about Pitt, but better to not spend too much if it is all getting dug up eventually. That design for Nelson/Fanshawe/Market Place is pretty good – in fact pretty much exactly what I put in my feedback a year and a half ago, so not much room for complaint! Only minor bone of contention: does the end of the northbound cycle lane past Pakenham Street East cut it a bit fine with parked cars immediately after? I know I often like to stay right out mid-lane on Market Place at the moment, just to prevent clashes with people pulling out from the angle parks. Good to know – I’d assumed from the diagrams that it was outside of the scope of the work. I wonder, how busy are those back streets anyway? Is it necessary to design them as arterials? Or would it be feasible to turn them into a Zone 30 / shared space? Angled car parks are always annoying, If I’m driving and someone starts pulling out of an angled car park, I usually wait and let him pull out. I would do the same on a bicycle, if it weren’t for the treat of aggression from drivers behind me. A major problem with angle parking in NZ is the layout that requires driving forward into the space. This results in vehicles reversing, often totally blind, into the traffic lane. The much safer way is to angle the spaces so that reversing in is required. The major impediment to this is the apparent inability of drivers to reverse their vehicles accurately. If you did that, then people will just turn across the street to park in the angled parks on the opposite side of the road. Well, that is illegal, so I doubt they would do it after receiving a few tickets. That is what used to happen in Princes St by the university. Then they would back out and be facing the wrong way. The issue with on-street angle parking is you need extra space behind the parking to allow people to back past the next car and see the through lane. But then cyclists ride in that bit and get struck. Plus that extra space encourages higher speeds, which is the last thing you want when a car is reversing blind out of a spot. Angle parking should be reverse in only and maximum 40km/h speed limit. And if you are parked alongside a truck, van or bloated SUV, backing vision into oncoming traffic is prejudiced. Methinks too many of us are driving too many big vehicles………….. The point is by changing the angle of parking that requires reversing in anyone that drives in would be ticketed. They would drive out with their eyes on the correct end of the vehicle to see any traffic be it cars or cycles. At present it is a ticketable offense to reverse park into angled parking even though it is demonstrably safer. Easy income for parking wardens to enforce the rule. This is a big step forward. There are some problems with it, but these can be fixed in future. Is there some kind of treatment (rumble strips, raised bumps, painted lines, etc.) that could be used to make driveway entries safer by raising driver awareness? Just behind the woman in this image, I really hope that AT actually learn from the example less than 1 km away. Ummm, those have been installed on Nelson Street since day one? +1, forgot about those, hopefully this will be extended into the new section which is one way. Interesting they spend so much time on losing a slip lane， but the fact that the design looks like a dogs breakfast didnt concern them? I make particular reference to on road/off road combination on eastern side. As others have said, this is excellent. But what about elsewhere around Auckland? 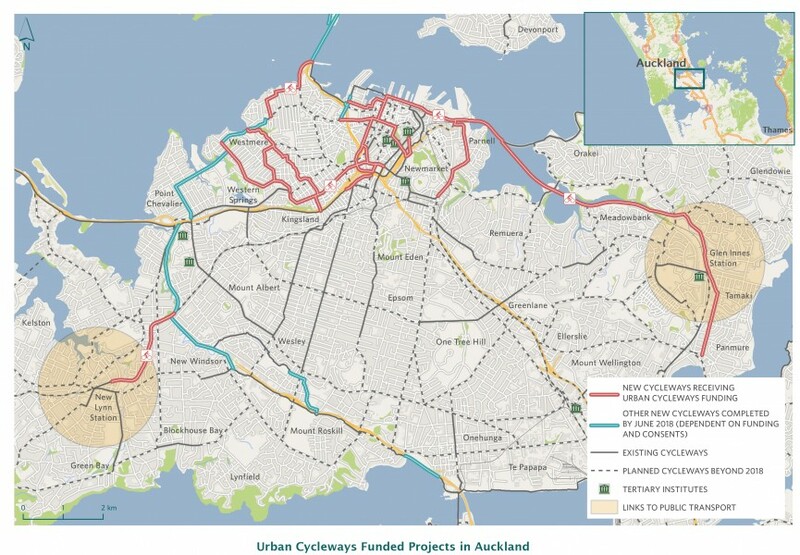 I’ve seen the Proposed Auckland cycle network map on the AT website, which looks great in theory. But is it known if/when it would actually be implemented? Is it actually likely to happen within the next few years, or is it off in the never-never? This all has to be completed by end of 2018 to use the urban cycleways funding. Thanks. Hmmm, the caption on that map says that the routes marked with dotted lines are post-2018. So they won’t qualify for the current urban cycleways funding? Also, the bus lanes (on Sandringham Rd. etc.) seem to be counted as existing cycle lanes. Does that mean they won’t be replacing those with protected cycle lanes such as those appearing in the central city? No, the dotted lines are not included; there is only $300m for the entire country in the Urban Cycleways Fund and those roads were a lower priority than the ones that are included. If the Urban Cycleways Fund is extended past 2018 then they may be included at that stage. Bus lanes are currently (sort of) counted as cycle lanes. The ones you mention are not included in this round of funding, again, as part of future projects they may get separated cycleways, but they are regarded as a lower priority. Some very successful stuff in Rotorua, and I’d argue that Wellington will be successful once something actually gets built under it. All that work to dig up Pitt St and make a big box underground… and then don’t actually have it as a functioning station entrance. Such a big forehead slap. I just hope that some time between now and the end of CRL construction that either AT or the Government of the day come to their senses and construct Beresford Sq station entrance properly. I hope they have learnt lessons from phase 1 on Nelson st with the problems that have been created. Traffic started banking up onto the motorway more often and further so instead of addressing the cause they made the off ramp 2 lanes. The redesign has caused lots of Nelson St congestion that now means phased run of green lights to Fanshawe St is impossible. The section between Wellesly St and Victoria St was badly done. Removing 2 car lanes and removing the free left turn has effectively reduced the crossing of Victoria St from 4 lanes down to 2. What an earth is the reason of putting in 2 sets of bike crossing lights 5M apart on the southern off ramp. Putting that garden in between the south western & southern off ramps seems to be the only reason they needed the second set.